There’s something sublime about having a good soak in a hot tub (or spa) after a tough day at the office, or just to warm up a tad once winter hits in full force. The hot water is bliss. And with an inflatable hot tub, you can reap the benefits of a spa without needing to spend your hard-earned cash on expensive renovation and installation costs. Read on and discover the different choices you have for an inflatable hot tub, to help demystify the buying process as you find the perfect portable spa for your home. We hand-picked the following inflatable hot tubs based on their popularity, price-points and differentiating features. A more complete review of each can be found later in this article. An inflatable hot tub is exactly what it sounds like, a portable and inflatable hot tub you can use on the fly, instead of installing a permanent version in your home. This is the ideal product if you’re looking for a spa that can be set up in minutes, and can be just as easily packed away if you’re not planning to use it, or the weather has taken a turn for the worse. You can also position an inflatable hot tub anywhere in your home, making it a perfect solution for anyone after a cheap and convenient alternative to a traditional hot tub. Easy installation. 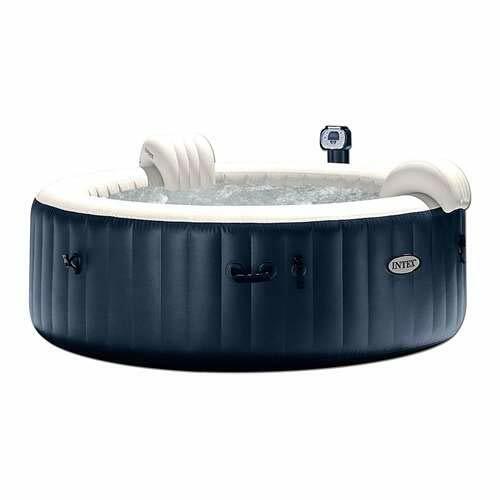 Most inflatable hot tubs come with an air-flow setting that quickly inflates the tub, and then you just need to fill it with water, turn on the heater, and throw on the cover. It’ll be hot and ready for a soak in under 24 hours, faster if the weather is still warm. Budget-friendly. Available for a fraction of the price of a traditional hot tub, these inflatable options allow you to experience all of the benefits, before you invest several thousand dollars so you can truly understand if you want a hot tub in your home. Highly portable. Without a fixed installation, you’re free to position the inflatable hot tub wherever you like, from a yard or location near your pool to an indoor area or even your basement, should that be where you want to relax. Packs away when not in use. Many spa owners want the benefits of a hot soak but don’t want to deal with maintaining a hot tub all year-round. 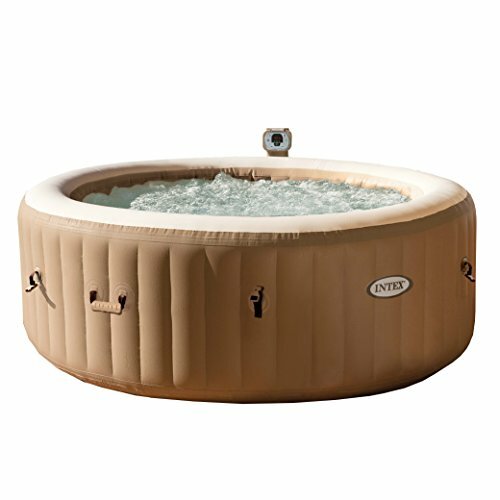 Inflatable hot tubs pack away into a compact carry-bag when not in use, and can be easily taken with you if you move house. Test before you invest. Buying an inflatable model first allows you to test out the features of a hot tub, before you decide to go all-in and invest and install a traditional model for your home. Space can be limited. While many inflatable hot tubs mention they can fit up to 4 or even 6 adults, this can put you all a little too close for comfort when you actually get in the water. To be truly comfortable, you’re probably only going to want two people in the one hot tub. Your energy bill will go up. Running the pump, heater and bubble jets will drive an increased power use, and if you’re a regular in the tub, you could be looking at an extra hundred dollars or more, each month in ongoing electricity bills to keep your spa running. It’s not ready instantly. The heating pads are designed to be efficient, but this means that once you first set it up, it may take up to 24 hours for it to reach the maximum temperature (what’s generally around 104 degrees Fahrenheit). Though this is common for all hot tubs, not just the inflatable ones. It won’t last forever. Because of their highly portable design, you can’t expect an inflatable hot tub to last more than a season or two. Look for a model with a good warranty and a history of excellent customer support, to ensure you’ve got your bases covered if something does go wrong. Let’s go over some of the main criteria you should apply to your decision making process when it comes to buying an inflatable hot tub. Size is an important consideration for an inflatable hot tub. Too small, and you’re going to be cramped and crushed if you have too many people using it all at once. Generally, you’re going to want the biggest inflatable hot tub available. That gives you more space to relax inside, especially if you have guests or friends over. You can all fit in the tub. But the added size does come with a cost. It’ll need more water to fill, will take more time to heat up, will, of course, take up more space, and the ongoing costs are going to be higher once you consider the power needs and different pool chemicals to keep the water clean. Do You Have Somewhere Suitable To Put It? 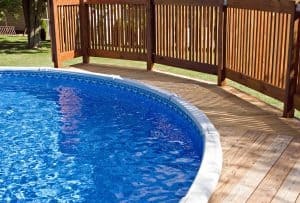 Finding the right position for your hot tub is essential because you don’t want to be losing all your deck space or cramping your yard unnecessarily. These products can take up quite a bit of room, and you’ll always have to drain it before moving. 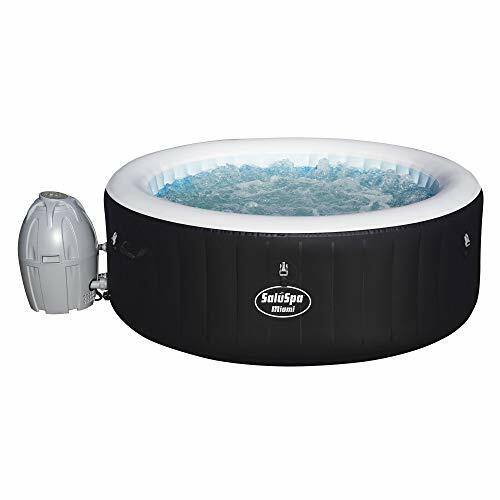 It’s also important to mention that most inflatable hot tubs cannot be exposed to temperatures below 40 degrees Fahrenheit, so you will either need to keep it indoors and protected from the extreme cold, or pack it away when the temperature drops. Finally, you need to consider the weight. Make sure that wherever you place your inflatable hot tub the supporting structure is strong enough to handle the weight. This is especially important if you’re planning to put it on a raised deck by your home. What Are The Temperature Limitations? Most inflatable hot tubs are only capable of heating the water inside to a maximum of 104 degrees Fahrenheit, though this is actually just about the perfect temperature for most users. What you need to understand with the setup though, is that it can take time for your hot tub to reach this ideal temperature. On a warm day, it may take 10 to 12 hours, but if it’s unusually cold, it could be up to 24 hours before your hot tub is hot enough to use. 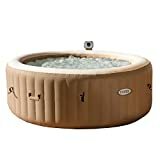 It seems like a disadvantage, but remember this is actually no different to a regular hot tub the first time you use it. Once it’s set up, you can use the automatic scheduling to keep your hot tub ready to go whenever you fancy a soak. Does Have the Features You Want? Generally, an inflatable hot tub is going to come with a pump, heater and a series of bubble jets that ring around the base of the tub to help massage and relax. Think about the strength of the jets that you would like, some particular models are more powerful than others, but this comes at a trade-off on electricity use. I’d recommend choosing a hot tub with an automatic setting for the heating element to keep the water temperature perfect, and consider getting an in-built filter to keep the water sanitary and clean between uses. This is a feature you’ll likely want, even if you think you won’t. Does It Include The Necessary Extras? Additional extras can make a big difference to how much you actually enjoy your hot tub, as most inflatable spas are pretty basic right out of the box. I’d look for a product with a base insulated cover to minimize any damage from the ground and prevent heat loss, prolonging the life of your hot tub as well as the heating element. An insulated cover is also a must-have, especially one that can lock for an added level of security to keep your kids out when they are not supervised. 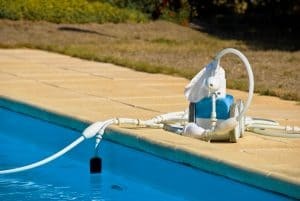 A convenient carry-bag helps for adequately storing your hot tub when it’s not needed over a long period, and pick a model that connects into the pump for rapid inflation/deflation. Some models even have LED lighting to create a beautiful ambiance when using it at night, and you can also purchase separate steps, drink holders and bucket seats to further boost your comfort levels when you’re using your inflatable spa. Of course, you can’t expect an inflatable hot tub will have the same life expectancy of a regular spa, but with the right care, these products will last you for a couple of years of use. Most customers will get a couple of seasons out of their inflatable hot tub, though some of the cheaper models will start leaking air or have parts fail before this time. The trick is to buy a quality product and to ensure you’re taking care of it if you want it to last. So far we’ve covered why you need a hot tub, the different inflatable variations you can find, and what features are important to focus on. In this section, we’ll be looking at specific products, each of which were hand-picked for review based on the same criteria I’ve outlined in this guide. Designed by Intex, this is an inflatable spa capable of accommodating up to six people to relax with the 170 high-powered jets in the soothing hot water. Featuring an easy to use digital control panel and heating system, it takes only 20 minutes to assemble, and the spa is ready to add water, making it a quick and easy setup. What I like best is the easy-to-replace filter cartridges that ensure your spa is always sparkling and clear, and the insulated cover and lock helps you trap in the warmth while being a nice safety feature. The biggest downside is the leaks, many users experienced a loss of air around the seams, and the heating element isn’t strong enough. This is our runner up for the best inflatable hot tub. Designed by Coleman, this is an inflatable spa capable of handling up to four people as you’re surrounded by 120 massaging bubble jets. Featuring a rapid heating system and cushioned floor, the i-Beam construction in the walls adds far more strength to this spa, while it remains lightweight enough for just two people to carry (while empty of course). What I like best is how strong the walls are, you can actually sit on these without them bending, unlike many other inflatable spas. 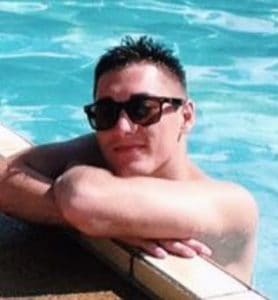 The biggest downside is the spa is not rated for use in temperatures below 40 degrees, and some users have found the temperature gauge to be a little inaccurate. This is our pick for the best inflatable hot tub. Designed by Coleman, the SaluSpa is an inflatable spa capable of handling 4 to 6 people with 120 relaxing jets to help you unwind after a long day. Featuring a digital control panel with an automatic start/stop controller for the heating system, all you need to do is choose the temperature you desire (up to 104 degrees Fahrenheit) and let the system do the rest. What I like best is how fast and easy it is to set up, you use the spas pump to inflate which means no extra equipment is needed. It’s also a robust little spa, with the walls constructed from TriTech reinforced polyester and PVC, for maximum strength. The biggest downside many users have faced is leaking air, and the pump giving out within a single season. Designed by Intex, the PureSpa can hold up to 4 people in this inflatable spa, surrounded by 120 high-powered bubble jets. Featuring a built-in hard water treatment system and filter, the water in your spa will always be hot, clean and refreshing. You also get a thermal ground cloth to better insulate the pool and a floating chlorine dispenser for treating the spa’s water. 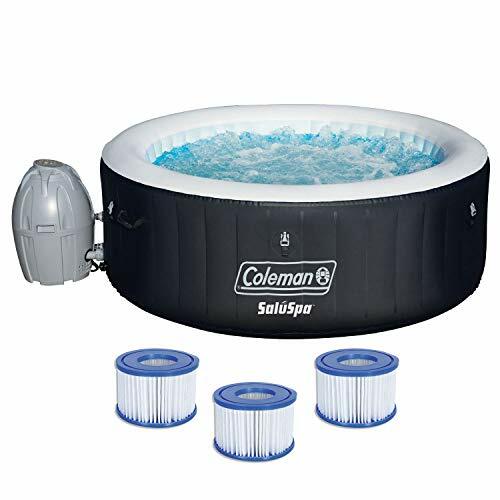 What I like best is the puncture resistant construction that ensures this is a highly-durable spa, along with the easy-to-replace filter cartridges. The biggest downside is the quality of the pump, many users have found this to fail quickly, and the control panel can go a little haywire as well. Designed by Bestway, the SaluSpa is an inflatable spa capable of seating up to four people to soak and relax in comfort when you need to wind down. Featuring a digitally controlled pump with a soft-touch control panel, you can set the temperature you desire (up to 104 degrees Fahrenheit). It’s also quick and easy to set up and doesn’t require any special tools or equipment. What I like best is the quality of the spa’s walls, it feels premium as the exterior is made from a TriTech reinforced PVC and polyester mesh to help the spa maintain its shape even when it’s filled. The biggest downside is the pump, it can be a little noisy, and some users have found that the spa begins to leak air after just one season. If you’re looking for a quick and easy solution to set up a hot tub in your home, an inflatable hot tub is a smart choice, and it’s one you can have installed and set up in just minutes. Buy yours today, and spend your next weekend soaking being pampered by relaxing jets in the perfectly heated waters.